have also been compared to such musical instruments as a kettle drum, zither, tambourine, bass violin, and trumpet. Other witnesses compare the sounds to a foghorn or propeller on a private plane. The sounds may also register in the lower (four-eight hertz) range. The amazing thing about this is that the sound is felt, rather than heard, and seems to come from everywhere and nowhere. The phenomenon of “NAD,” a Sanskrit term signifying transcendental, astral, psychic or paranormal music (i.e. with no apparent source) may have some of its origin in the occurrence of “dune tunes.” A friend related this experience to me years ago when he reported mysterious “harp-like” music he heard over the wind late at night during a solitary desert camping trip. He admitted that he had no idea where the ethereal sounds were coming from. Only seven places in the continental U.S. are permanent home to the singing sand concerts, and one of these is a short drive away in the Mojave Desert on the way to Vegas. Two others are in the far reaches of Death Valley National Park. All have been closed to dune buggies and other assorted sports for many years. The only way in is to hike. In order for plain old sand to emit unearthly sounds, there are several exacting factors that need to be present: The grains have to be round and between 0.1 and 0.5 millimeters in diameter, the sand has to contain silica, and a certain stable humidity must be present (typically less than 0.1 percent, depending on the size of the grains.) The further the material has traveled to its present home, the better, since as a result of wind and buffeting action against the ground and other sand grains, the individual grains are usually more uniform. 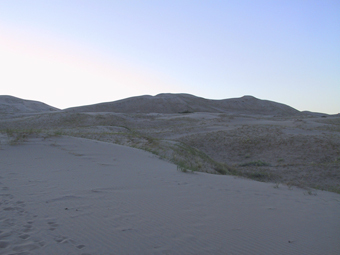 Kelso Dunes, about 30 miles south of Baker, is perhaps the quintessential singing sand hangout, certainly in California, and possibly in the world. The drive south from the I-15 seems to take longer than a half hour—the landscape is typical SoCal desert, with Joshua trees and the usual scrub stretching to the horizon. Eventually, the land begins to slope downward, and the dunes heave into view. About eight miles after the town of Kelso (a seemingly uninhabited place with an incongruously large railroad yard), signs indicate the turnoff to the Dunes. Don’t speed on the washboarded gravel: nearly invisible but deep and dry creek beds cutting across the road will make the car bottom out and total the suspension of the most hardy vehicle. The main sand hill, 650 feet high, is visible from the road and a strenuous hike from the last turnaround. There are a few methods to get the sand to perform, but a 1979 report by Caltech scientist D.K. Haff probably gives the best instructions: “…the most spectacular and enduring vibrations were produced by the movement of large quantities of sand. This could be initiated by vigorous kicking at the sharp dune crest in order to dislodge a metastable surface layer on the lee slopes.” Plain English translation: “Go to the top of the dune and kick sand down the steep side.” Make sure the day is calm, since wind will not only mask the sounds, but also tends to make for unstable conditions that keep the sand from cascading evenly. On a recent expedition I discovered that just walking along the crest of the highest dunes will elicit a sound not unlike a tuba, making each step a musical experience. Panamint Dunes, a mere three-mile hike from the dirt road, is located in the Panamint Valley, just over the mountains west of Death Valley on highway 190. This dune field has the least amount of reward for the singing sand tourist, likely due to the shape of the grains and the presence of underground water close to the surface. Eureka Dunes, however, beats out Kelso in a photo finish at 680 feet, and the musical activity is only slightly less spectacular. Eureka is also at the end of a bone-jarring 44-mile drive over a graded dirt road. This dune field features all the booming activity found at Kelso, albeit with less volume, but the best chance for solitude, which may be the most important thing. 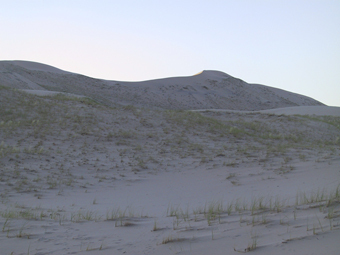 Kelso Dunes: 28 miles south of Baker on Kelbaker Road, or 14 miles north of Interstate 40. Panamint Dunes: Approximately 7 miles north of highway 190 on the Big 4 Mine Road in the Panamint Valley, then a 3-mile hike. Eureka Dunes: From Ubehebe Crater, 2.8 miles; then turn right onto Death Valley (graded dirt) Road. Proceed 21 miles northwest to Crankshaft Junction. Bear left, continuing on Death Valley Road, which heads southwest up and over the Last Chance Range. After 12.3 miles, turn left (south) onto South Eureka Road and travel 10.7 miles to the north end of the dunes. Last couple of miles are rough. Inquire at the Death Valley Visitor’s Center for road conditions. The Stories on this site are just the tip of the iceberg. Buy Weird California today!